A new forecast from International Data Corp. expects the virtual reality (VR) and augmented reality (AR) headset market to grow from from 13.7 million units in 2017 to 81.2 million units by 2021. But while VR headset will account for more than 90 percent of the market for the next few years, AR headsets are expected to grow exponentially in the final two years of the forecast – capturing a quarter of the market by 2021, according to the market research firm. 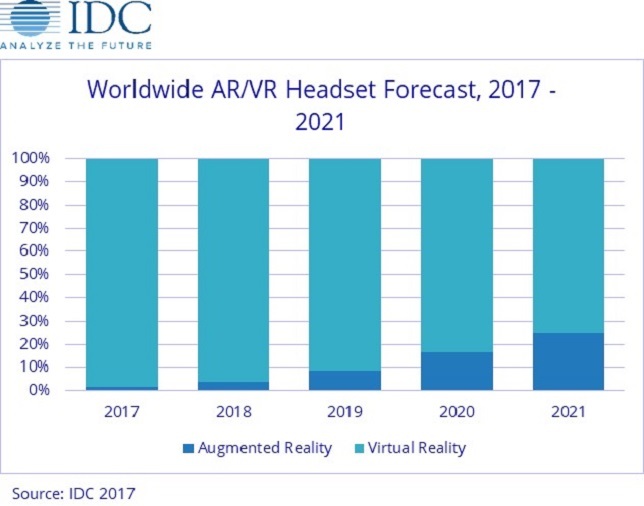 IDC's Worldwide Quarterly Augmented and Virtual Reality Headset Tracker sees VR headsets driving a "near-term shift in computing," with price reductions and new entrants impacting growth. “Screenless viewers such as the Gear VR will continue to maintain a majority share throughout the forecast, although the category's share will continue to decline as lower-priced tethered head-mounted displays (HMDs) gain share over the course of the next two years,” the firm said in a press release. "Meanwhile, IDC is predicting that standalone HMDs will gain share in the outer years of the forecast. On the AR side, IDC predicts growth both in volume and functionality. "AR headsets are on track to account for over $30 billion in revenue by 2021, almost twice that of VR, as most of the AR headsets will carry much higher average selling prices with earlier adopters being the commercial segment," said Jitesh Ubrani, senior research analyst for IDC Mobile Device Trackers, in a statement. "Meanwhile, most consumers will experience AR on mobile devices, although it's only a matter of time before Apple's ARKit- and Google's ARCore-enabled apps make their way into consumer grade headsets." For more information, visit the IDC site.